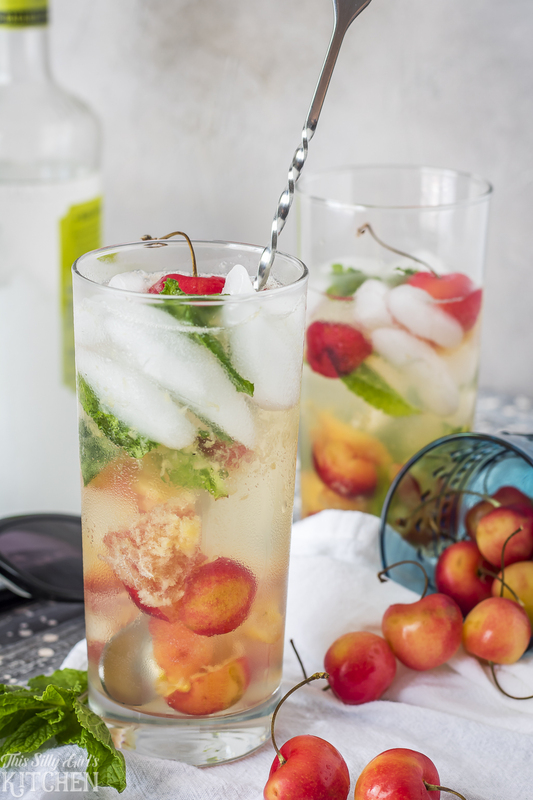 Rainier Cherry Mojitos, Fresh Rainier Cherries muddled with mint leaves, mixed with rum and fizzy soda! Hi, friends! I’m back with another amazingly delicious mixed drink recipe for you all!! 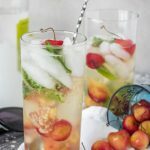 Rainier Cherry Mojitos…. Oh em geeeeeee. 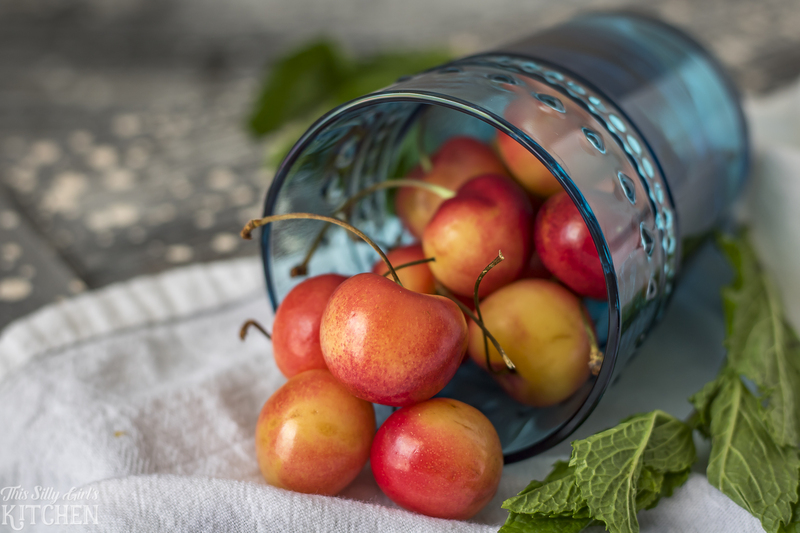 Rainier cherries are my personal favorite variety of cherry I have tried. To me, they are slightly more sweet than a traditional cherry. With light orange-yellow interior, they are also a lot less messy!! 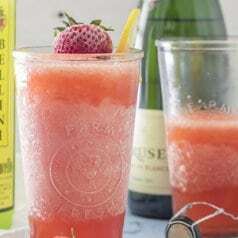 I really wanted to create a summer drink that was bursting with freshness. 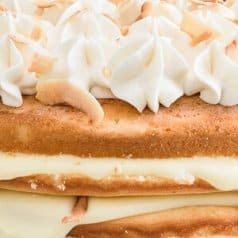 I really believe I achieved that with this recipe! 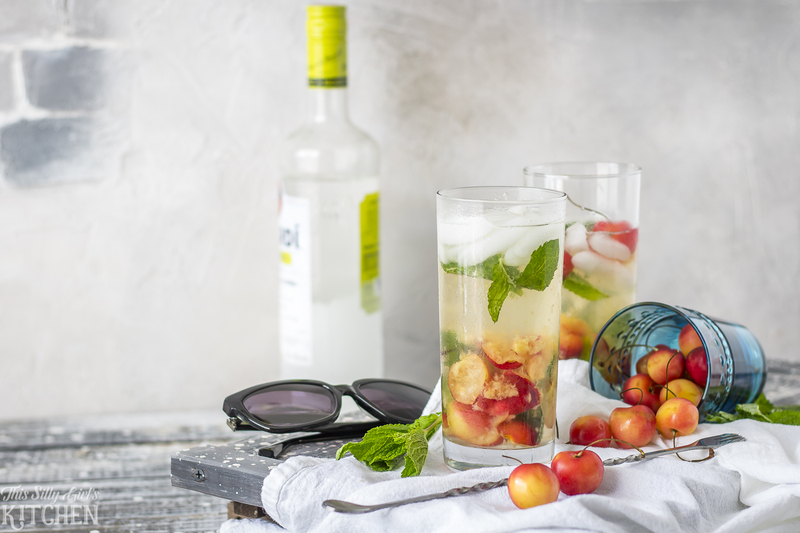 Along with the cherries, this mojito has fresh mint leaves. Anything with mint is just so refreshing and bright. 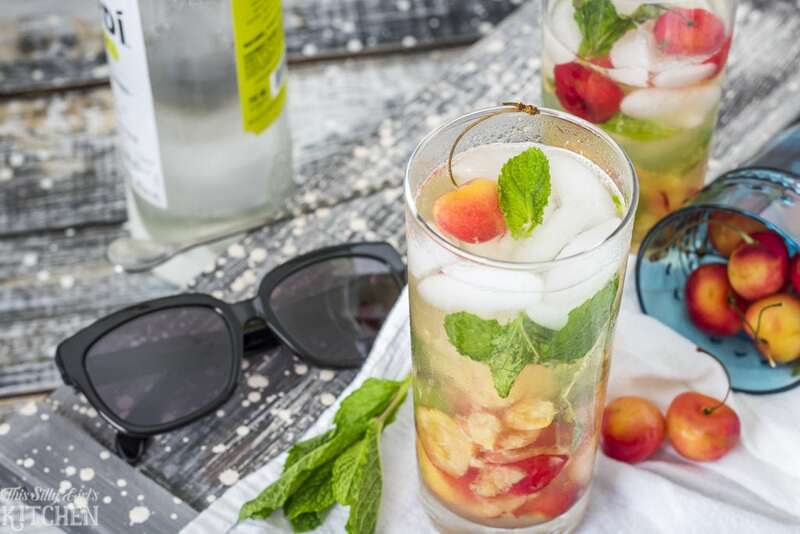 Perfect for summer sippin’! Break out those sunglasses, whip up a couple of these mojitos and get comfy in that lounge chair. You have a long hard day of relaxing on your back patio to do! Thank you to DiscountGlasses.com for sponsoring this post, now I can wear my sunglasses and sip this mojito too! As you know, I wear glasses all the time. I didn’t use to wear prescription sunglasses because every time I went to purchase them, they were just so expensive. 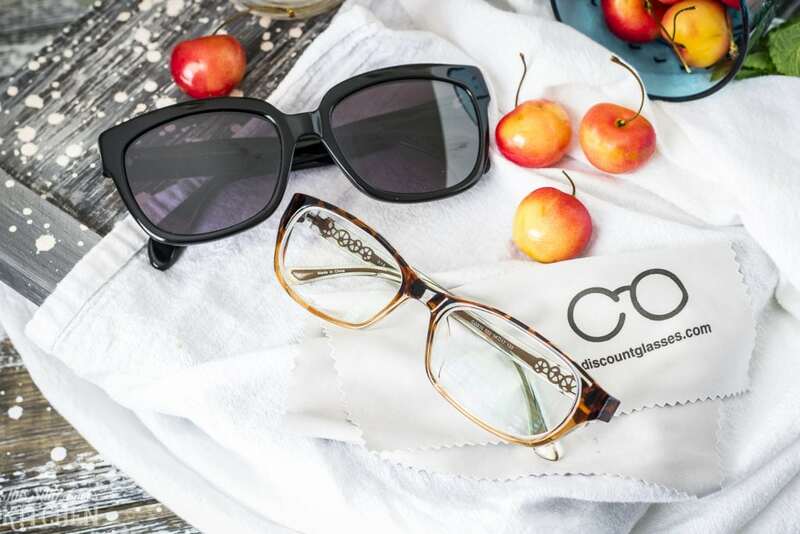 But, then I was introduced to DiscountGlasses.com and they are so much more affordable! All you need is your prescription, then par-ooze their site. Pick them out and they get sent right to you, score! I actually went ahead and got regular glasses too, aren’t they cute?! They have a large variety of glasses and sunglasses to choose from. You can even shop there if you don’t need a prescription and are just looking for an affordable set of sunglasses. Score! Now, on to the recipe!! 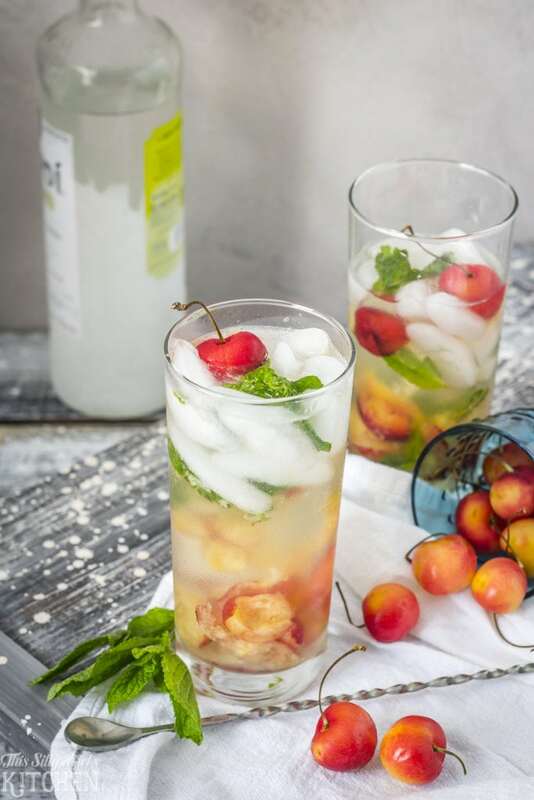 In a tall glass, add the cherries and mint leaves to the bottom. Muddle until the cherries are broken up and the mint leaves are very bruised and fragrant. Top with ice, add rum and fill the glass with the soda. Stir and garnish with cherry and mint if desired. I just love the fun colors in this drink. 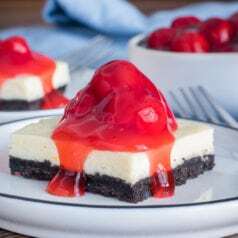 What is your favorite way to enjoy cherries? 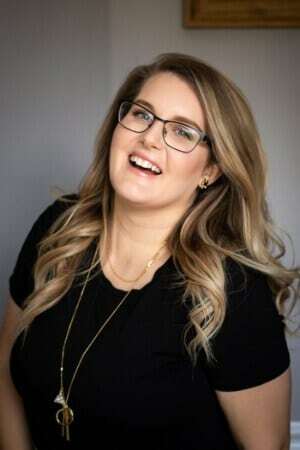 Thanks again to DiscountGlasses.com for sponsoring this post!